Helping a loved one go through the consequences of suffering a stroke is not an easy process. As hard as it is for you, it is that much harder for the person in question, especially during the painful period of recovery which takes its toll on their emotional well-being. However, the constant care and providing them with products that facilitate the path of recovery can be of huge help during their journey. If you are uncertain regarding how to deal with the situation, take a look at our tips aimed at helping you understand the condition and become acquainted with some beneficial products for stroke victims. To begin with, a stroke is defined as the interruption of the blood supply to the brain. This interruption can happen when an artery or a blockage bursts which results in failure to supply the brain with the sufficient oxygen and nutrients. As a result, brain cells die. When a stroke happens there are four important symptoms that you should recognise and react fast. In fact, you should remember the acronym FAST – Face drooping, Arm Weakness, Speech Difficulty and Time to call 000. If you react instantly the chances of surviving are big and that also increases the chances for a full recovery. After the hospitalization, the recovery continues at home. In order to know how to facilitate the process of recovery, you should get familiar with some of the conditions they might have. Firstly, there might be an impairment of the arm and hand which results in decreased strength, coordination and range of motion. You can help the stroke victim by providing additional arm support and regularly repeat the stretching exercises determined by the doctors. Moreover, a more severe condition is hand paralysis which is the inability of a muscle to move voluntarily. The treatment for it is rehabilitation therapy, medications for relaxation of the muscles, antispasticity orthotics and functional orthoses. Secondly, suffering from a stroke may leave the victim with difficulty in speaking and communication, a condition called aphasia. This is one of the most frustrating conditions which can lead to PTSD after the stroke. In this case, you need to be very patient with your close one and remember that it is only the ability to speak that is affected by the stroke and not their intelligence. You can use a book of words, pictures and symbols to help them get their message across. When it comes to the PTSD, there are two main treatments: with medications (antidepressants and anti-anxiety) or psychotherapy. What you can do regarding PTSD of your loved one is to be very patient and supportive all the time. Together with all the care and support that you can provide for your loved one, there are lots of products for stroke victims that can help their rehabilitation process. One such product is the mobility scooter which renders the possibility of moving wherever your loved one wants to go when they have problems with mobility. Usually operated by one hand, the mobility scooter is specially designed to illuminate the path and enable a smooth ride. 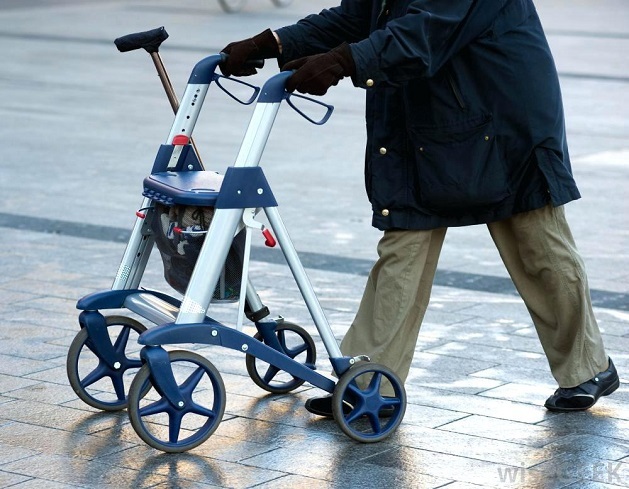 Another mobility aid from the products for stroke victims is the seat walker which has features such as a sturdy frame, easy fold locking system, graduated and numbered upright shaft with easy adjustments, handbrakes and an ergonomic turning circle for easy push. Your loved one can use it to go shopping or for a stroll in the park. Finally, you can provide your loved one with tools they can use in the kitchen including an electronic bottle, can or jar opener which operates on one touch or an electronic peeler so that they can retain their individuality when preparing meals. Additionally, a moulded Dycem pad can provide an effective non-slip surface on which they can place the ingredients while cooking.